I have to work on Labor Day this year (1 September 2014), so I decided to take Thursday and Friday for a long weekend. Unfortunate, my son Daniel had class at Wake Tech College and wife gets U.S. Holiday off while I work. It will be solo weekend for with my dog Ziva. The weather was perfect in the beginning of week; cool temperatures and low humidity. By the weekend in 90s and higher humidity. But it seem Friday was the better day to get underway for day than Thursday. The winds on Thursday were from the Southwest, while on Friday for the East at 5-10 knots. 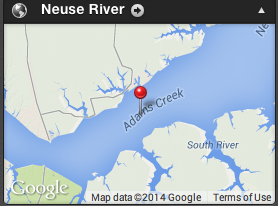 I usually found that when they forecast winds from 5-10 knots, there are usually higher on the Neuse River. The sky cleared up around noon and winds was coming out of the East, so it would be easy to pull way from the slip. 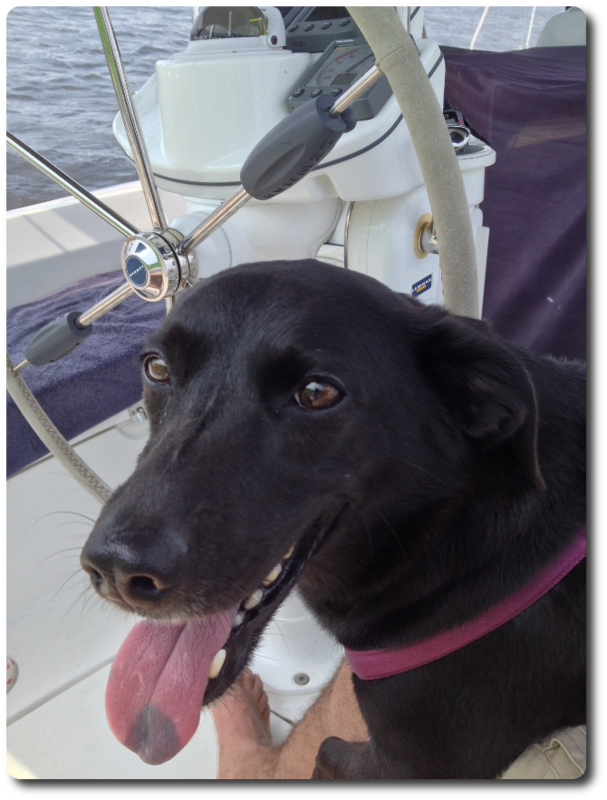 Ziva and I got underway at noon to cruise the Neuse River. The wind was blowing +10 knots. All we did was to track across the river to Adam Creek several times. We completed 4 legs (or 4 round trips). We tracked 8 times. At times we were kneeling at 15 degree in 14 knot wind. It was fun to get underway for a change. But real excitement didn’t happen until we were heading home and at Oriental enter Marker #1. On our track, I put us in the position to sail to Oriental Marker #1, drop the sails and motor into Whittaker Creek. It was about 13:45 and we started motoring toward Whittaker Creek Channel. We were cruising at 2,200 RPM and making good head way. At 13:50, there was a cat boat on course to Oriental on perpendicular track. I increase my RPM to 3,500 to clear him. I was waiting to see if he was going to track. It turn out that he was doing the same maneuver as me, tracking across the river to Adam Creek and back, expect his track was taking him closer into Oriental Harbor. After I pass him, I drop my RPM back down to 2,200. When on of the sudden, I lost forward motion and my RPM drop to below 2,000, and smoke was coming out of the cabin. I stopped my engine and took a quick look down below and notice black exhaust smoke coming from inside the cabin. Around 14:00, I heave-to and I called Tow Boat US at Deaton Yacht Service. I checked online after mooring, it is most likely an issue is the cast iron Yanmar exhaust elbows. It’s a known problem with the Yanmar engine. The wind was getting stronger and was drifting toward Windmill Point. I raise my sailing again to head back to Oriental Marker #1. Howard Cheetham got underway in his power boat to assist. It took some time for Deaton “Capt. Ralph” to arrive at my location. The tow boat “Capt. Ralph” arrived on-site at 14:30. I lower my sails again and was towed to my slip at Whittaker Creek Yacht Club. We moored at 15:30, again with Howard assisting with the lines. Over all it was a good. I hope I can get my sailboat fix by the end of September. September 1, 2014 in Oriental-NC, Sailing.